It is completely wrong – Blocker’s contract at Leichhardt did not consist of meal vouchers! Blocker was a big baby and grew to be a big man. His stocky build made him a bull-like runner up the middle and he possessed hands as big as dinner plates. He could offload in the blink of an eye and set up countless tries or line breaks for team-mates. Known for his aggressive approach and powerful running close to the rucks, Roach was arguably the number one prop in world rugby league at his peak. However, he was also notorious for some unfortunate on-field indiscretions, which may have written more headlines than his otherwise dominant play. He stood up for himself bravely, sometimes starting and occasionally finishing a stoush with an opponent. Reports and visits to the sin-bin in the 1989 club season may have contributed to his omission by State selectors from the Blues Origin team. 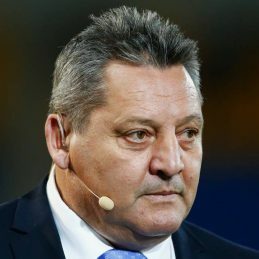 In a game in 1990 against Manly at Brookvale, Blocker received a four-week suspension for backchatting referee Eddie Ward. It probably didn’t help that Blocker had patted Ward on the head after he was ordered from the field and he certainly did himself no favour when he gave the touch judge a verbal bashing on his way off the field. But at his best, Blocker was part of one of the strongest packs in club rugby league history. Together with Sironen, Elias and Pearce, the side dominated opposing forwards. Steve is an accomplished speaker, honed by many years commenting on the game. He’s left the verbal bashings on the field – expect an entertaining show from the big man of league.